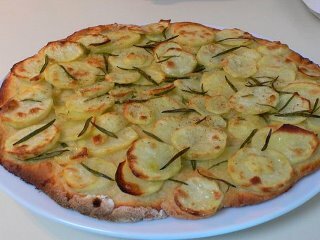 Potato and rosemary white pizza: White pizzas are so-called because they do not have any tomato sauce on them. The most famous of these types of pizzas is one topped with potato, garlic and fresh rosemary. 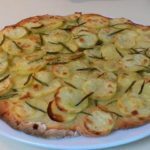 Potato and rosemary white pizza is very commonly found in and around Rome. Be sure to slice those potatoes as thinly as possible because the thinner the better. This pizza may not look like much but it really is very, very tasty! First lightly salt and oil the pizza dough once you have rolled it out then dot it with the crushed garlic. 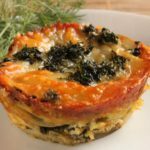 Arrange the potato slices in roughly one even layer. 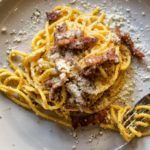 Sprinkle with the rosemary, a little more salt and drizzle with olive oil. Place in the oven for up to 15 minutes or until golden brown.